I happened to watch OWD BOB on TV last night and I was very glad to find out that it's an English movie after I was convinced that the girl Maggie has very English accent( London accent actually). I had lived in England for three years and it's a shame that I didn't visit Isle of Man. The scene in the movie was beautiful and peaceful. It reminds me of Isle of Skye which I visited this summer. The movie was about quiet countryside life but it didn't bore me. James Cromwell was brilliant as an old withdrawn farmer. I thought the character was in his sixties, but I found out on internet that he's only 57 when the film was made. 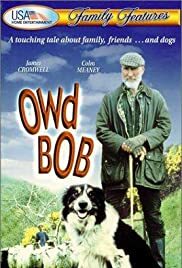 I don't think the movie has shown much about the dog Owd BOB. It's more about the relationship between the grandfather and grandson, and people's feeling about each other. The movie doesn't have much dialogue, but we could feel what they were thinking. The movie has some little mistakes, but generally it's a good touching film that make me think. I wish that I would go back to UK and visit the island one day.